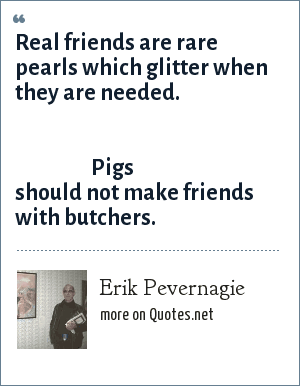 Erik Pevernagie: Real friends are rare pearls which glitter when they are needed. Pigs should not make friends with butchers. "Erik Pevernagie Quotes." Quotes.net. STANDS4 LLC, 2019. Web. 23 Apr. 2019. <https://www.quotes.net/quote/63522>.